Mad World hasn’t dated because it’s expressive of a period I call the teenage menopause, where your hormones are going crazy as you’re leaving childhood. Your fingers are on the cliff and you’re about to drop off, but somehow you cling on, so reported Dave Simpson in the Guardian when Michael Andrews and Gary Jules updated Tears For Fears’ Mad World in 2003. 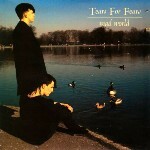 They called themselves Tears For Fears, a name they chose after being introduced to Arthur Janov’s psychology book The Primal Scream by Roland’s guitar teacher. They were fascinated by his theories and beliefs that crying is a good way to allay your worries and nightmares can be good because they release tension. The remake was arguably only a massive hit because of its inclusion in the 2001 film Donnie Darko but it wasn’t the original choice. The film’s director, Richard Kelly, wanted to use U2’s track MLK but couldn’t afford the rights, so Andrews and Jules, who were childhood friends, made a rough recording of the song to see if Kelly thought it would be suitable. Kelly was so impressed that he used that same recording on the film. Donnie Darko was not an immediate success, but it was a film that students would discuss and in 2003, with its release on DVD, it garnered a cult following. The soundtrack album did well and the record company decided to release Mad World in time for Christmas week 2003 where it went two places better than the Tears For Fears version and went to number one. It was a surprise chart-topper because normally the festive number one is often uplifting or quirky but this was ghostly. The Darkness was at number two that week with Christmas Time (Don’t Let the Bells End) but in a sense, it was the darkness that won in the end.